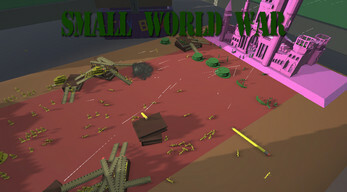 Small world war is a game that takes place in the imagination of a young boy playing with his toys. instead of doing his homework, you play as one of the imaginary toy soldiers fighting off hordes of enemies on a great desk battlefield with a dollhouse-castle "loaned" from your little sister. You get to recruit more toy soldiers to help you defend the castle and install battle-defenses to keep the swathing enemies away. You win if you withstand 20 rounds and lose if every single one of your allies die. After a round has passed you receive loot from which you can purchase upgrades and recruit more allies with. We had a blast making this game and are pretty proud of ourselves over what we accomplished on the time we were given. our group consisted of one programmer, two modelers and one idea-guy/moral-support. Every asset except the music and sound effects were created by us during the 72 hours, and we are already really looking forward to the next gamejam! Ludum Dare 38-Jam Game by Mathias "Simex", Henrik "Hengen" and Trym "HelloMyNameIsPig"
After pressing the play button you will be presented with an in-game menu, this is where you do your pre-battle upgrades and recruiting. You are given 5 actions points with which you can spend on creating more defenses, upgrading existing defenses or go out looking for loot. On the right side of the screen you can see how much loot you currently have. The buttons have their loot costs right next to them. Buying units don't cost action points and only show how many you have in reserve (not units currently stationed in their respective battlestations). Soldiers killed in battle will be replaced with the soldiers you have in reserve so it is wise to try and keep a healthy supply of soldiers up. When you feel like you are ready to fight you simply press the Start day button. The controls are as follows: wasd-keys for movement, shift for spring and left-mouse button to shoot. Very impressive game considering the 72-hour time limit. Even without considering the time limit, it's a pretty fun game. I will admit, the title had me excited for World War I and II weapons but the game is fun enough for me to shelve that disappointment. Would love to see it expanded with unrestricted placement of defenses and more weapons.